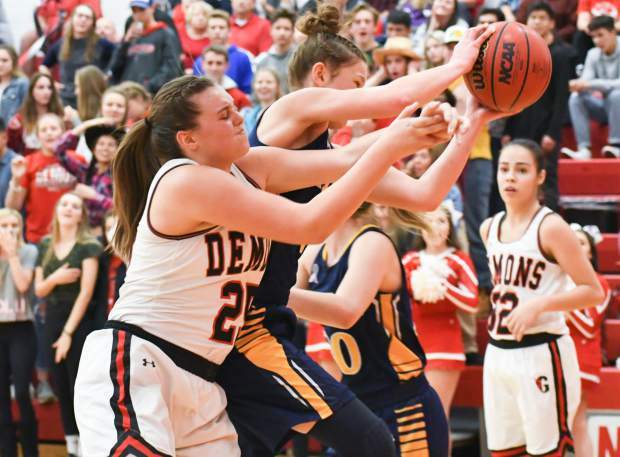 Glenwood Springs Demon Tatum Peterson and Rifle Bear Elly Walters fight for possession of the ball during Thursday night's game. 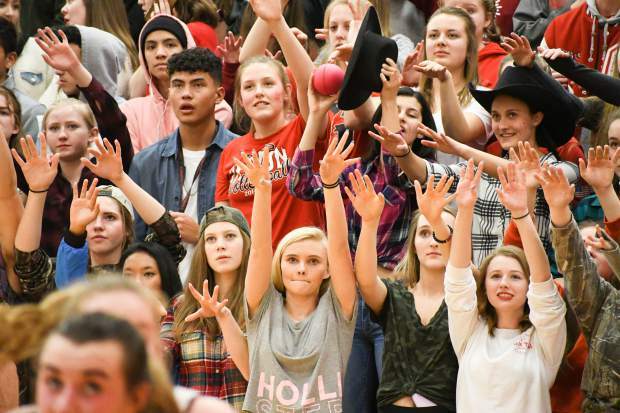 The Glenwood Springs student section raise their hands during the rival game against the Rifle Bears on Thursday night at Glenwood Springs High School. The Glewood Springs Demon sideline and head coach Rhonda Moser cheer on the team during the rivalry game against the Rifle Bears. 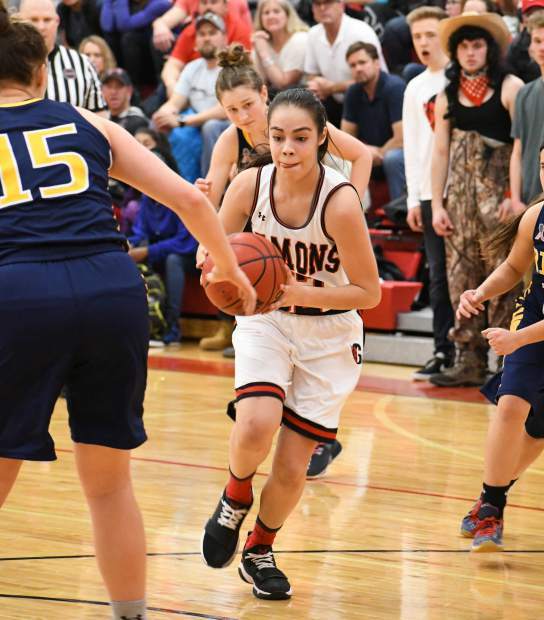 Glenwood Springs Demon Ximena Guiterrez runs the ball around the defending Rifle Bears during Thursday night's game at Glenwood Springs HIgh School. Glenwood Springs Demon Ximena Guiterrez jumps for the lay up during Thursday night's game against the Rifle Bears. 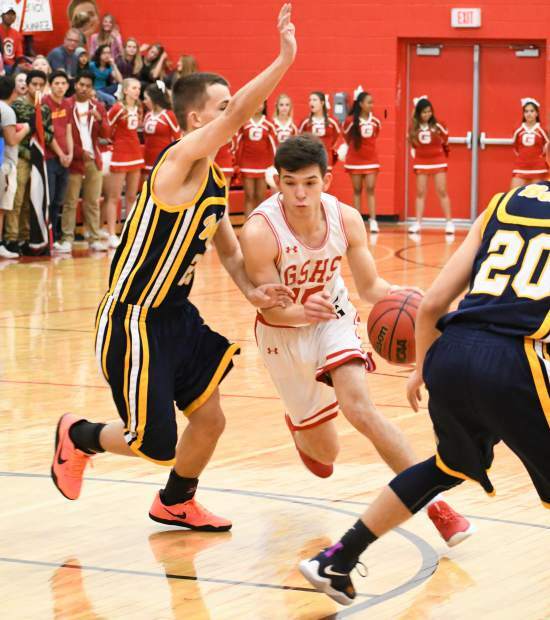 Glenwood Springs Demon Tatum Peterson fights to keep posession of the ball during Thursday night's game against the Rifle Bears. 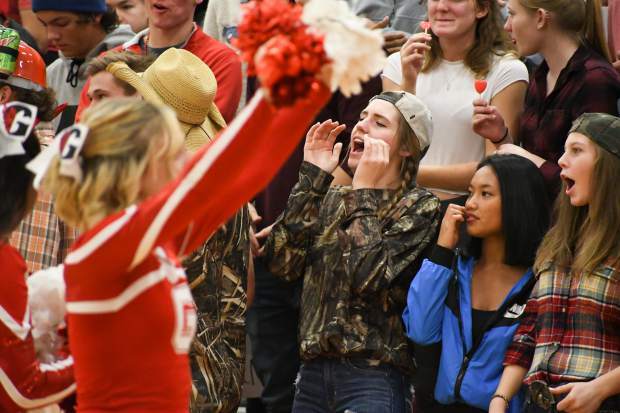 The Glenwood Springs student section yells and cheer during the rival game against the Rifle Bears on Thursday night at Glenwood Springs High School. 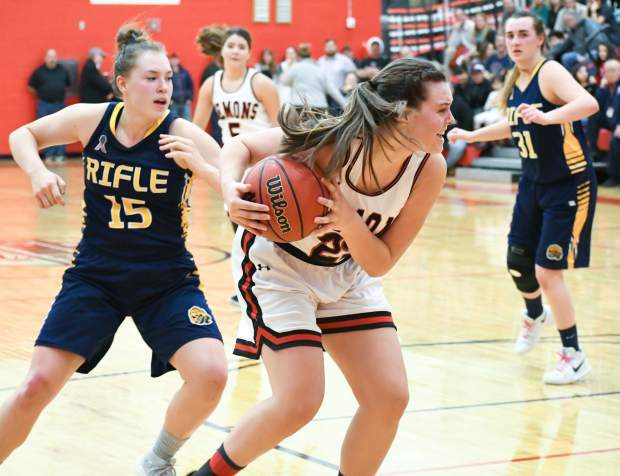 Glenwood Springs Demon Natalya Taylor dribbles the ball through the defending Rifle Bears during Thursday night's rival game. In a matchup of the No. 1 Rifle Bears – and back-to-back league champions – against the No. 2 Glenwood Springs Demons’ girls basketball team in the 4A Western Slope League standings, the Demons played spoiler Thursday night inside Chavez-Spencer Gymnasium, stunning the visiting Bears, 42-34, to end Rifle’s undefeated season in league play while sending the five Glenwood seniors off in style on Senior Night. Riding the emotional roller-coaster that was Senior Night for the Demons, Glenwood came out red-hot, playing fast and loose to storm out to a 13-4 lead after one quarter of play. 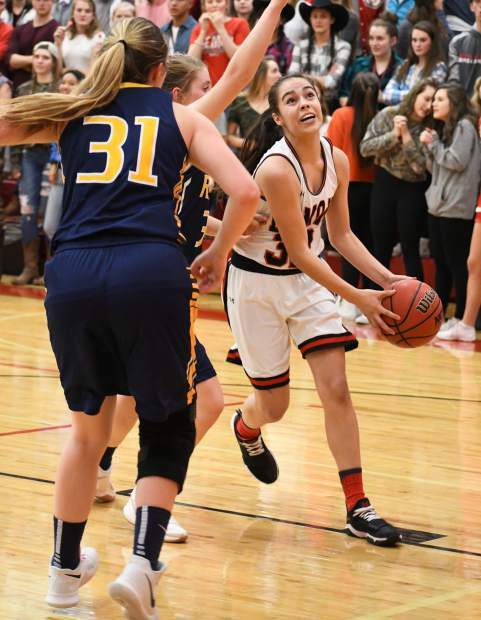 After two free throws from Rifle senior Peyton Caldwell that gave the Bears a 2-1 lead, Glenwood went on an 11-0 run led by sophomore guard Natalya Taylor’s stellar play off the bench, as the speedy sophomore had a hand in six of the 11 Glenwood points in the run, scoring two buckets in transition and finding sophomore Qwynn Massie with a slick bounce pass through traffic for a layup. Late in the quarter, Rifle senior guard Katy Manuppella took a hard spill into the padded wall along the baseline after a layup off of a steal from senior Elly Walters, forcing the Bear senior to miss the rest of the game, in what turned out to be a rather physical affair between the two rivals. 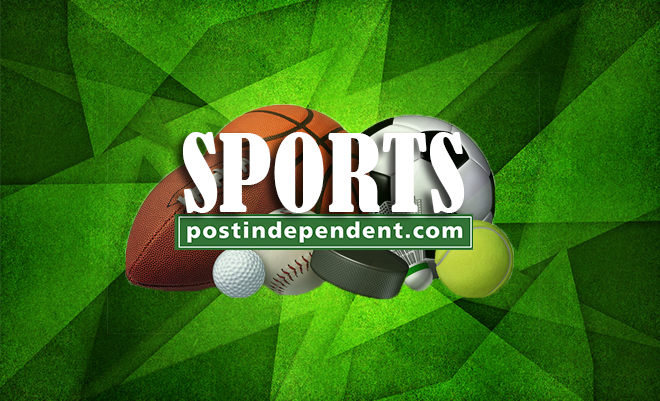 Holding a 13-4 lead after one quarter of play, Glenwood’s offense slowed down dramatically in the second quarter as the Demons scored just six points, allowing the Bears to find their footing. Rifle junior forward Masi Smith started the second quarter with a jumper before Glenwood senior Saylor Warren and junior Ximena Gutierrez hit shots in the paint to make it 17-6 Glenwood. Walters then got on the board midway through the second quarter with a mid-range jumper, but Taylor answered right back with steal and layup, forcing a Rifle timeout with the Demons in front 19-8. Coming out of the stoppage, Rifle Head Coach Kristy Wallner drew up a play for Walters, allowing the standout senior guard to break free of Bolitho’s hounding defense for a 3-pointer, that held up as the final field goal of the half, sending the two teams to the locker room with Glenwood in front 19-11. Sitting just 16 minutes away from a huge upset win on its home floor, Glenwood came out energized in the second half as senior forward Ellie Moser dialed in from beyond the arc, splashing home a 3-pointer to start the half, igniting the home crowd. Walters answered right back with a jumper from the left block, but Moser got an open look from beyond the arc again and rang true for her second straight triple, pushing Glenwood’s lead to 25-13 over Rifle. Following Moser’s second 3-pointer of the game, the Demons went on a 6-0 run as senior Dani DeCrow skied in for a rebound off of a missed shot, grabbing the offensive rebound and getting the putback shot to fall, while Gutierrez banked home a runner in the lane and Warren hit a tough layup to make it 31-13 Glenwood. 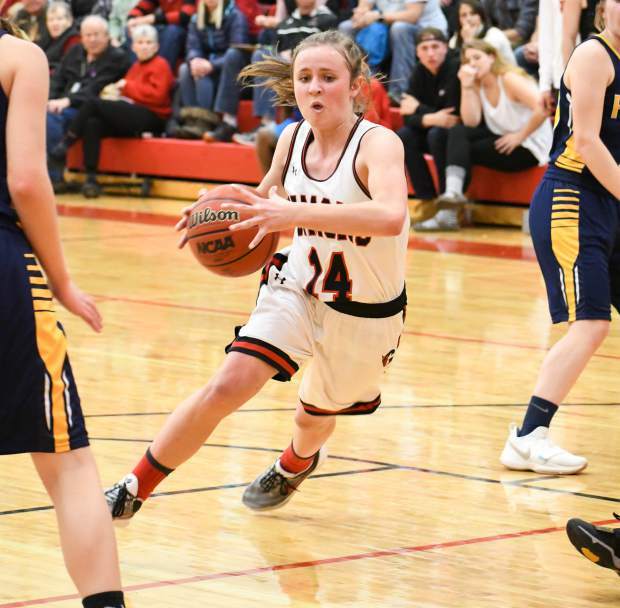 Rifle responded with a jumper from senior guard Karly Manuppella, but Taylor closed out the third quarter with layup, giving Glenwood a 33-15 lead heading into the final quarter of action. 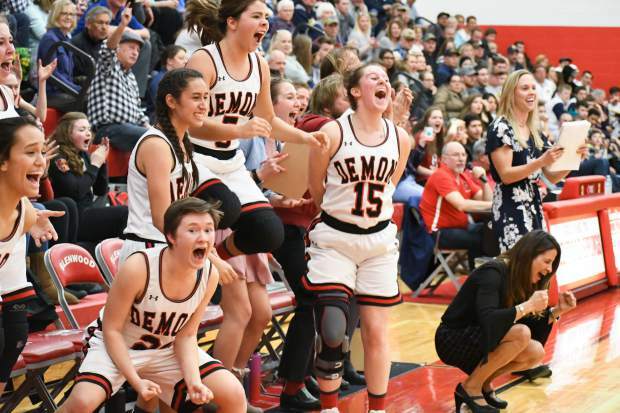 In the fourth, Rifle attempted a furious rally as Caldwell and Smith drilled two 3-pointers each, but Glenwood went 5-for-6 from the free throw line down the stretch to close out the thrilling 42-34 win on Senior Night for the Demons. 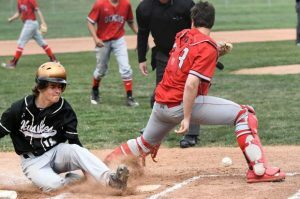 “All week, we talked about how when we play Rifle, we end up playing their game,” Glenwood Head Coach Rhonda Moser said. 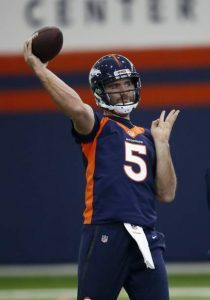 “We don’t press them, we sit back and unfortunately let them play their game. All week, we said we’re going to play our game. 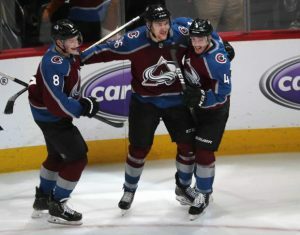 I told the girls that they’re a good team and they’re playing well, so we’re going to go and let them beat us and see what happens. Coming into Thursday’s rivalry game, Rifle checked in at No. 14 in the 4A RPI standings, while Glenwood sat No. 34, just outside the top 32 cut-off for a first-round home game in 4A. 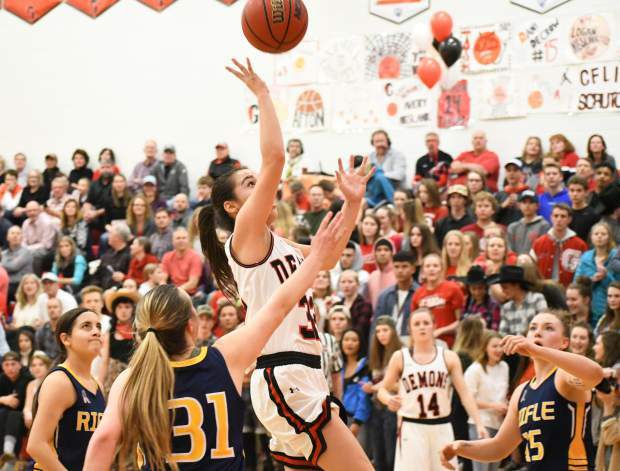 Although the loss might be disappointing for the Bears, who attempted to finish the 2017-18 season undefeated in league play, Rifle has plenty to look forward to in the 4A state playoffs, even if this one is tough to swallow right now. In the win, Taylor, Moser and Warren led the Demons with 8 points each, while senior center Tatum Peterson and Gutierrez added 6 points each. Peterson led Glenwood with 10 rebounds, while Bolitho led the way with four assists. Walters led Rifle with 9 points, while Caldwell and Smith scored 8 points each. Rifle (20-2, 11-1 4A WSL) will host the Montrose Indians Saturday evening in a nonconference matchup to close the regular season, while Glenwood (15-8, 10-2 4A WSL) awaits the 4A state playoff bracket results, which will be released Sunday morning. 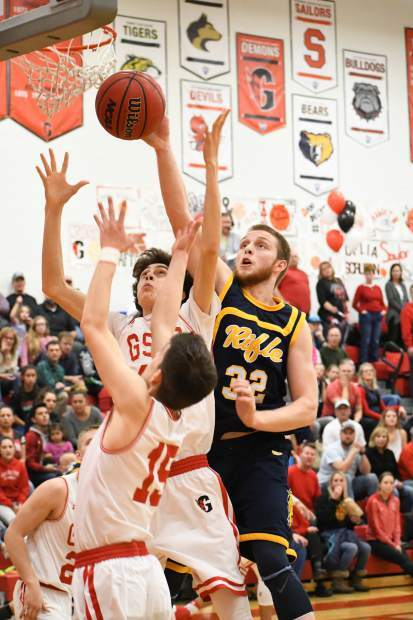 For roughly a quarter and a half Thursday night inside Chavez-Spencer Gymnasium, it looked like the Rifle Bears’ boys basketball team would spoil Glenwood’s Senior Night, holding a 23-5 lead at one point. 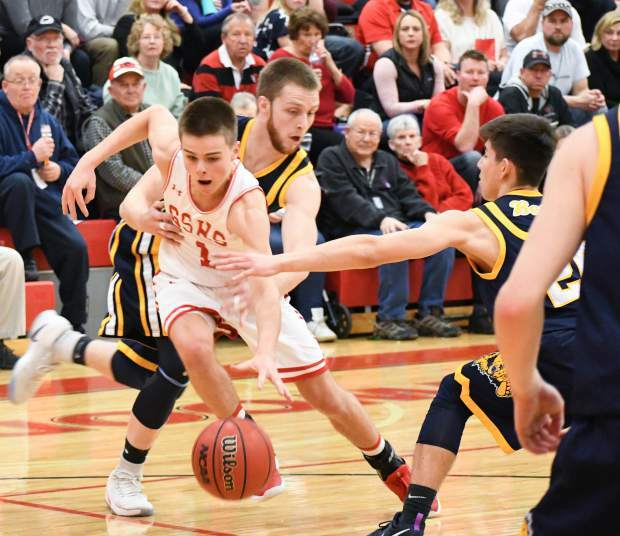 But a furious second-half comeback that saw Glenwood lead by as much as 16 points allowed the Demons finish off the regular season undefeated in league play with a 60-50 win over the Bears in the rivalry matchup. 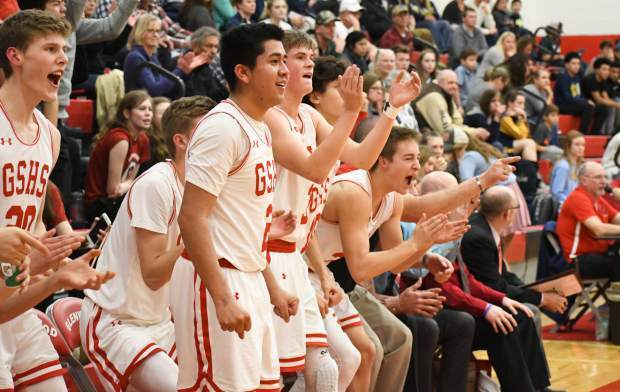 Rifle started the game on a 9-0 run as senior center Blake Swasey hit a layup and two free throws, while senior forward Evan Gray and junior guard Darien Church hit layups down low, stunning the full-capacity onlooking crowd at Glenwood Springs High School. Two free throws from Glenwood junior Angel Garcia and one free throw from Glenwood junior guard Chano Gonzalez ended up being the only points the high-octane Glenwood offense scored in the first quarter as a putback shot from sophomore guard Carter Pressler gave the Bears a 13-3 lead after one quarter of play. 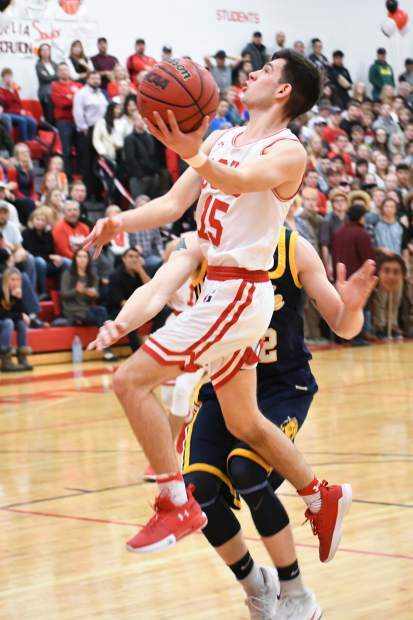 Two layups from junior Joel Lopez and a 3-pointer from sophomore Trey Lujan gave the Bears their largest lead of the game at 23-5 early in the second quarter, but at that point, Glenwood turned it around in a hurry, largely thanks to Garcia. The junior guard hit a 3-pointer from the right corner to get the Demons back on track before then forcing a Rifle turnover on the ensuing inbounds play, giving Glenwood possession. The Demons then drew up a play for Garcia on the inbounds play, leading to the junior’s second straight 3-pointer, igniting the home crowd. Senior Aaron Smith built off of Garcia’s two threes with a runner in the lane to make it 23-13 Rifle, before Gonzalez hit two free throws, Smith hit two free throws and Garcia picked up a steal at mid-court, racing in for a layup just before the buzzer to send the two rivals into the locker rooms with the Bears clinging to a 26-19 lead. Coming out of the locker room, Glenwood continued that run as the Demons opened up the half with six straight points thanks to a layup from junior Luke Gair off of an assist from Garcia, before the junior then hit a 3-pointer and recorded another steal and layup, tying the game up at 26-26, forcing a Rifle timeout. Swasey stopped the Glenwood run with a two free throws on Rifle’s next possession, but the Demons kept up the pace and pressure, going on an 8-0 run as Smith hit a runner and went 3-for-4 from the free throw line, while senior Gabe Suarez hit a layup and sank the ensuing free throw on the and-1 attempt, giving Glenwood a 34-28 lead. Rifle battled back with a layup from Lopez and two free throws from Gray, but Glenwood went into the fourth quarter with a 37-32 lead. In the fourth, Garcia splashed home his fourth 3-pointer of the game, while Smith and Gonzalez hit triples of their own, giving the Demons a 56-40 lead before the Bears battled back towards the end of the game, thanks to a layup from Gray and a 3-pointer from Lujan, closing out the game with the Demons battling all the way back for the 60-50 win. 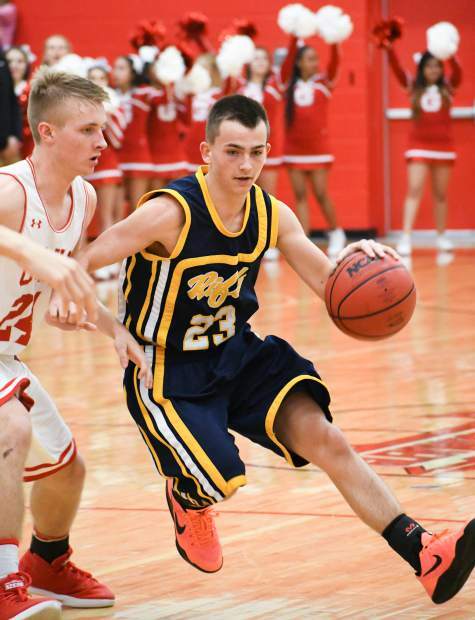 For Glenwood (19-4, 12-0 4A WSL), Smith led the way with 19 points, while Garcia kept pace with 18 points. Gonzalez chipped in with 9 points. Rifle (2-20, 1-11 4A WSL) received 14 points from Lujan and 8 points from Swazey, while Lopez and Gray added 7 and 6 points, respectively, in the loss on the road.